General Information and location: To get to Antelope Island take Exit 332 on I-15 in Layton. Turn left onto Antelope Island Road and continue through Layton to the Causeway+. Entrance fees: $9 for each car and $3 if you are biking. Camping is available at Bridger Bay Campground and White Rock Bay Campground for $13 a night. There is no water at the Bridger Bay Campground so either bring enough or stop at the Visitor Center. Gnats are a problem in the Spring on the island so make sure to bring a head net. They don't bite but will drive you crazy because they fly into your nose, eyes and ears.On this blog I have included posts giving information on the Buffalo Point Hike, Lake Point Trail, Frary Peak and Fielding Garr Ranch House. Activities on Antelope Island: Biking is popular on state park roads. Watch out for groups of bicycles on the shoulder when driving in the park. Throughout the year roads might be closed for races. Visitors come from around the world to watch birds and wildlife on the island. In fact Antelope Island has one of the largest breeding colonies of California Gulls, Wilson's Phalaropes and Eared Grebes in the United States. Viewable wildlife include Coyotes, Bison, Antelope, Bighorn Sheep and Mule Deer. With about seven trail heads hiking is a popular activity on the island. Trails range in length from 0.25 to over 16 miles in length. Make sure to inquire at the Visitor's Center about trail conditions and difficulty. 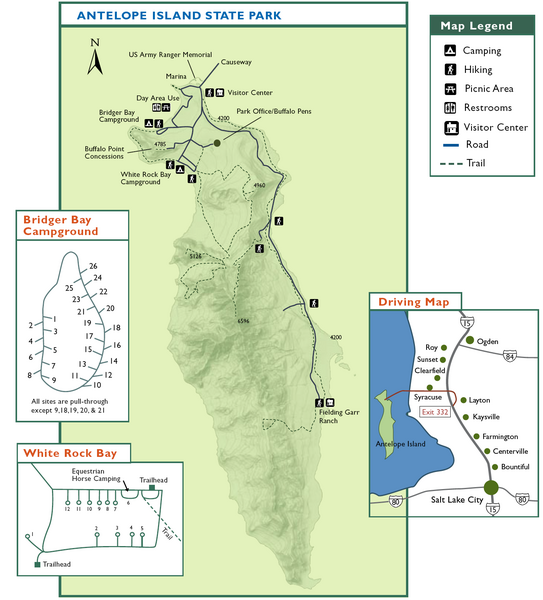 Popular trails include Buffalo Point, Frary Peak and the Lake point trail near Bridger Bay Campground. The Frary Peak trail gains over 2100 feet of elevation to an elevation of 6596. Caution: there is no shade when hiking so make sure to bring enough water and wear a hat. I would suggest hiking early in the morning before the sun becomes intense. Buffalo Point is a nice place to watch the sunset over the Great Salk Lake. If you are a runner there are runs throughout the year of various lengths including 5Ks, 10Ks, 50Ks, and 100Ks. If interested inquire on the state park website. Short History: Antelope Island has a rich history of human habitation from Native Americans to settlers. The earliest known habitation on the island was 6,000 years ago with the Freemont people. They were primarily hunters and gatherers. The Visitor's Center has an impressive collection of viewable artifacts. Important settlers include John C. Freemont and Fielding Garr. John C. Freemont and Kit Carson, the first people of European descent, arrived at the island in 1845. They did not stay very long but hunted large game including Antelope. 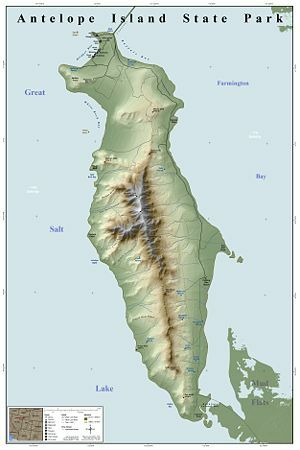 In 1848 Fielding Garr established residency in the southern part of the island. His family and John Dooley Sr. herded Sheep and Cattle until 1981 when the property was brought by the state. Brigham Young paid him to watch the Tithing Herd for the LDS Church. This herd provided funds for the Perpetual Immigration Fund which funded church members to immigrate to Utah. In 1981 the state of Utah acquired the rest of Antelope Island. (Information from State Park website and Wikipedia).